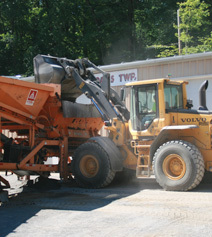 Hammaker East provides state agency approved superior cold mix asphalts. We also have the ability to manufacture on location and produce cold mix asphalt in state-approved, trailer-mounted portable asphalt plants. As environmental concerns become increasingly important, we offer specially developed, 100% GREEN cold mix asphalt that emits zero hydrocarbons. Only Hammaker East can bring you this kind of top quality cold mix asphalt product with on-the-spot convenience.